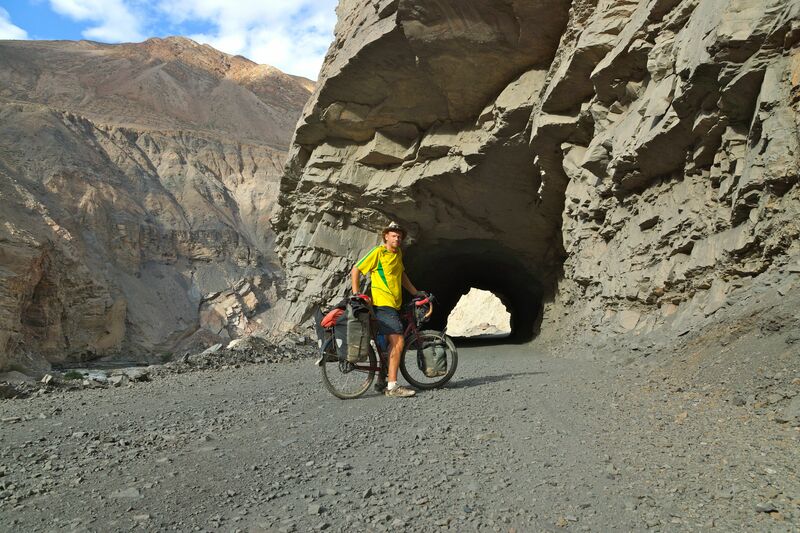 – The Dalton Highway in Alaska is a great road to ride once per lifetime. – Alaska seems a nice place to just go and get crazy, literally. – SPAM in a conveniently sized plastic packet has to be one of the innovations of the decade. – The most civilized establishment in north America is the cinema in Oregon that serves you pizza and craft beer. – Oregon is the coolest place for great craft beer and bicycling culture. – “We don’t need no stinkin’ bad cheese” (Post 19) has to be the worse pun in the known world. – No one ever improved a banana by frying it (Colombia). – Veracruz has the best tacos in the world. 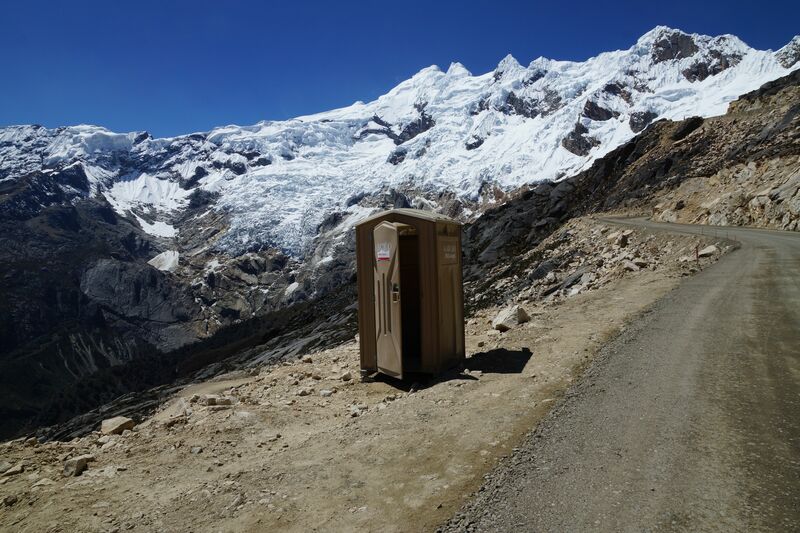 – The Peruvian Andes take the prize for gob-smacking scenery. 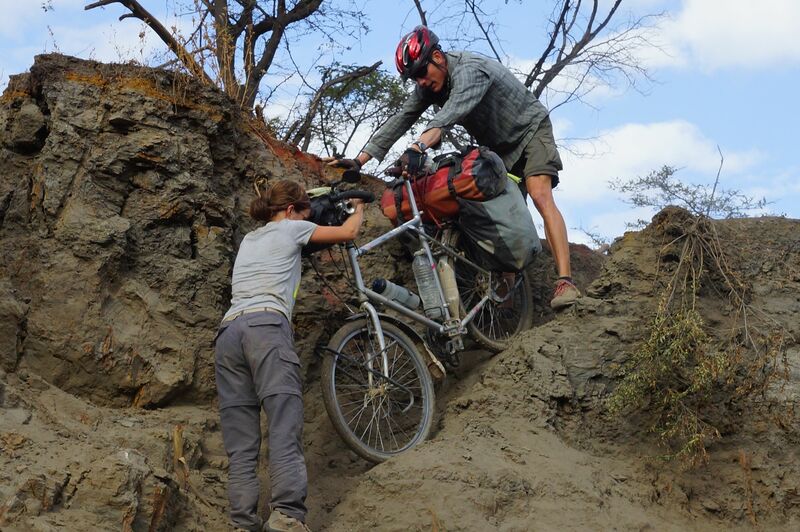 – Colombia and Oregon vie for the prize of cool cycling and cool people award. 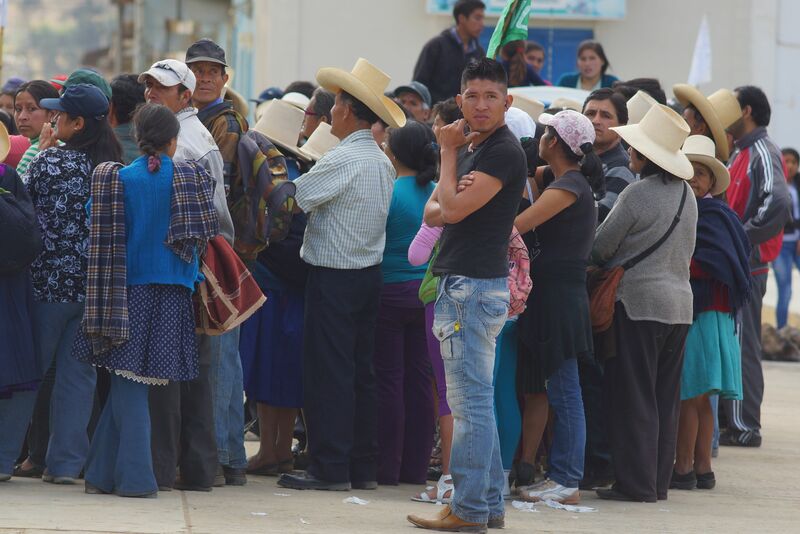 – Peru and Honduras vie for the prize of ‘most irritating roadside people’. 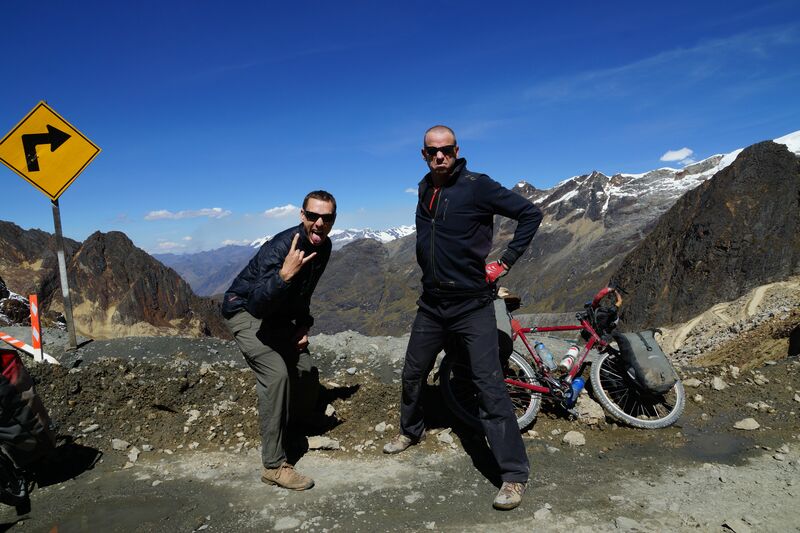 – Hardest riding has to be the highland Andes route through northern Peru. 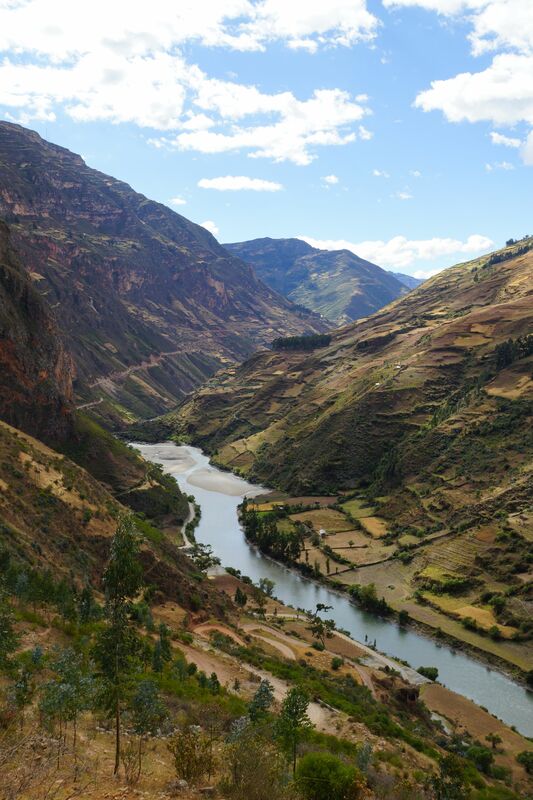 – One of the happiest moments would have to be getting through that river in Peru the other week. – Never try to cycle with a welt on your right buttock. 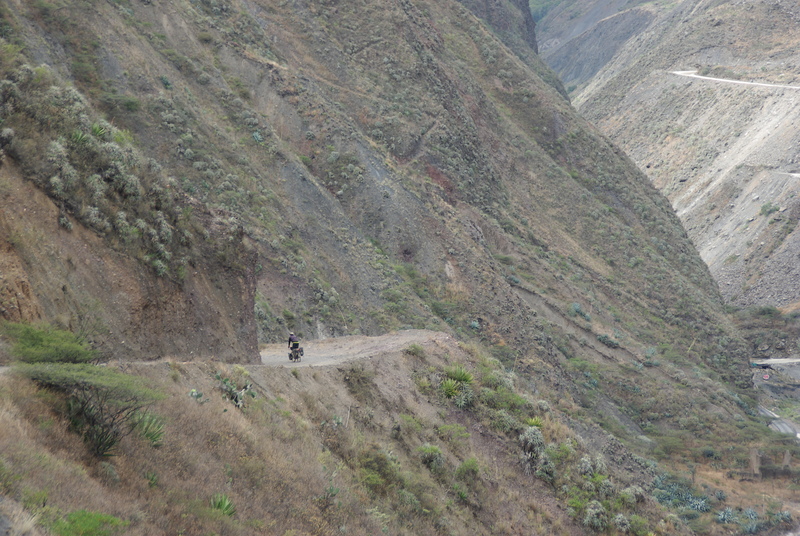 Two days north of Ayacucho I had awful dirt road with fine dust on a layer of sharp rocks. I thanked the Great Lord Harry for a half-moon that shone a welcome dull light onto the road as the map and bikeroutoaster program again proved inaccurate leaving me a bonus 17 km to get to the village of Mayocc and, as an added bonus, a rear flat 15km out. 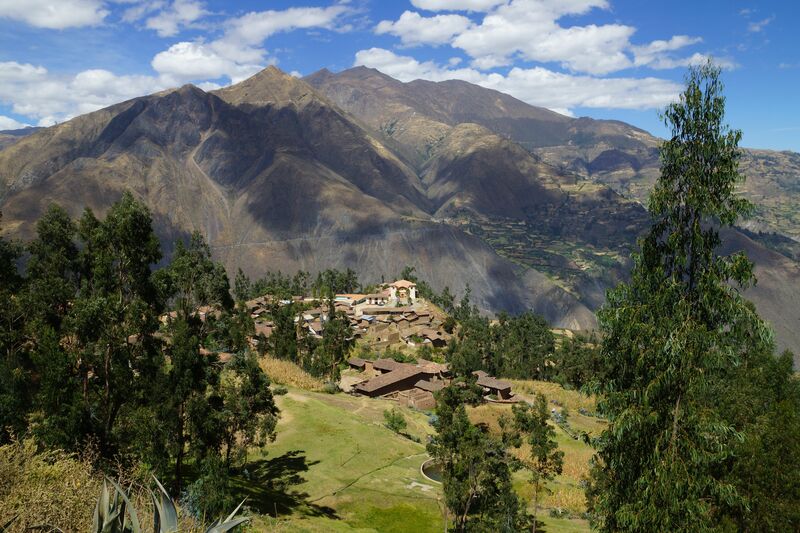 So it became quite a ride of 117km and I put it right out there to get to the very plain village and its restaurant/knocking shop with lovely chicken & rice, soup, beer, and some banter about being single and needing a Peruvian scrubber girlfriend. The road was an absolute shocker all day with the fine dust getting kicked up with each passing vehicle. As night came it was almost a blessing not to be able to see the bloody thing properly as I gallantly pedaled on into the night. 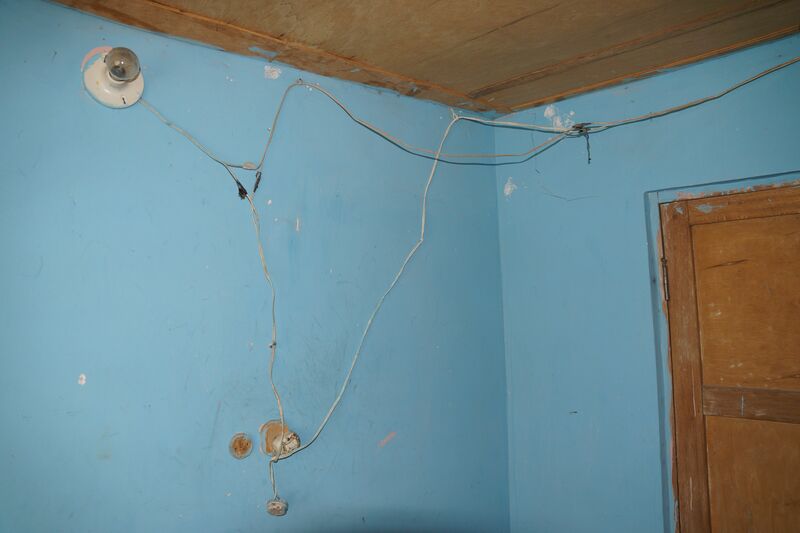 Happily ensconced in the $4 room for the night I must remember to ask if the electrician referred to the ISO9001 standards when installing the electrical wiring in my hospedaje. Since the morning of my leaving Huanuco, have had the unexpected experience of actually meeting fun and engaging Peruvians (they had to be somewhere). Even in the midst of a double puncture repair this afternoon, the family that gathered to watch the gringo curse and sweat and have his legs bitten by some nasty little bugs, were cheery, something that has been sadly lacking to date. 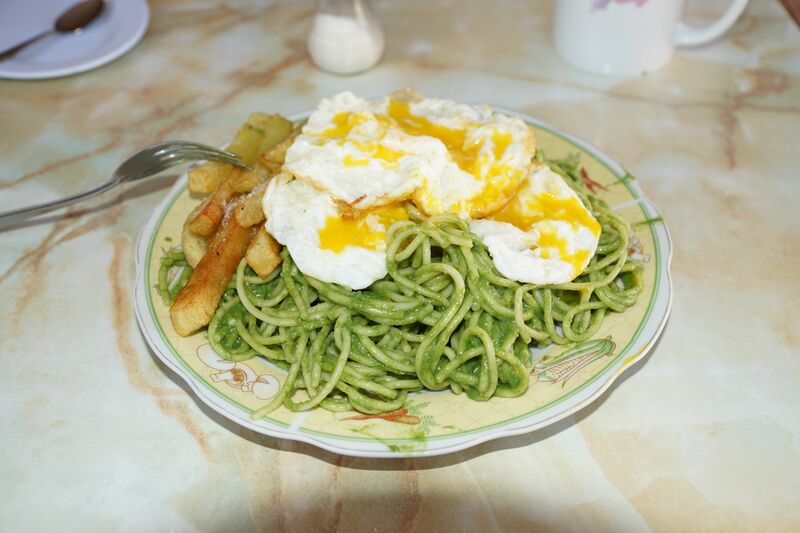 There is supposed to be a gastronomic festival in Ayacucho this weekend. Given that Peruvians seem to default to chicken and chips at any opportunity there have to be some pretty nervous chickens in the vicinity. 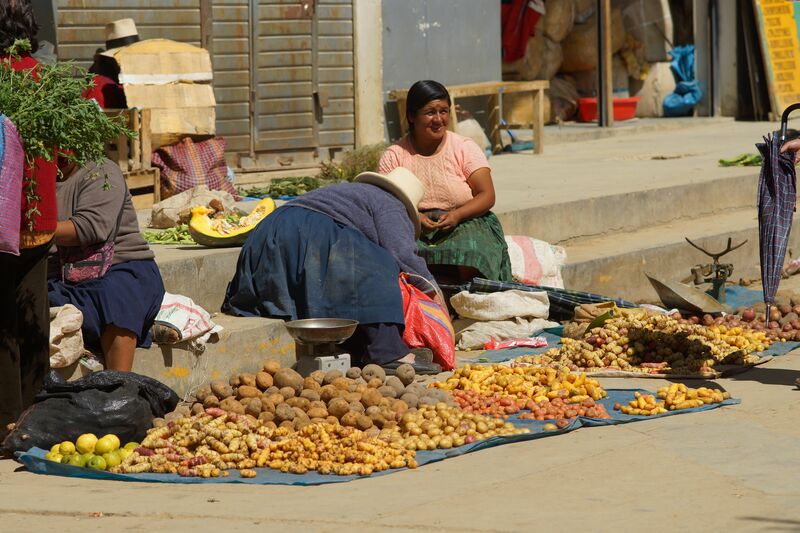 Ayacucho has a bustling and energetic city centre with loads of young people buying cell phones and pizza. 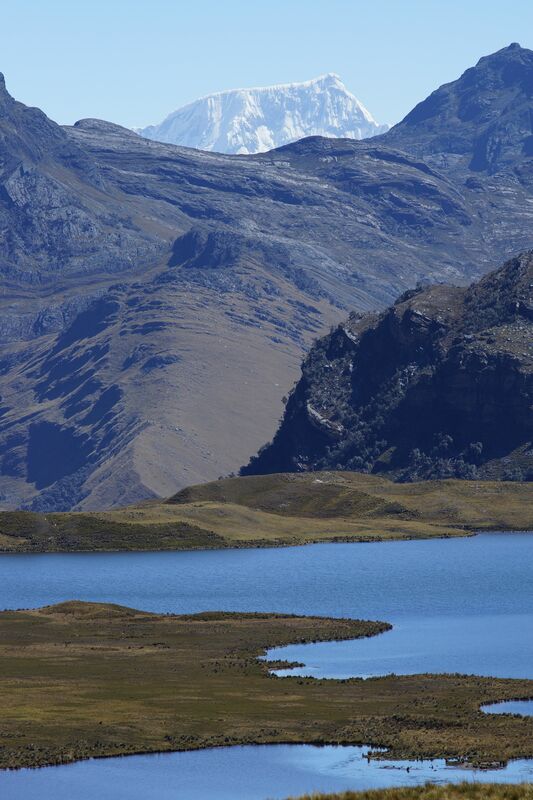 It’s a great place for a day’s rest and recharge the batteries for the passes to come between here and Cuzco. A plethora of dentists (no idea why) is just too tempting so stop into one for a clean and polish. Never been so happy to see the lights of the little village of Mayocc emerge from the gloom. In the endless quest to improve your viewing pleasure, I’ve added the Ecuador and Peru photo sets to the ‘Photo gallery link to Flickr. 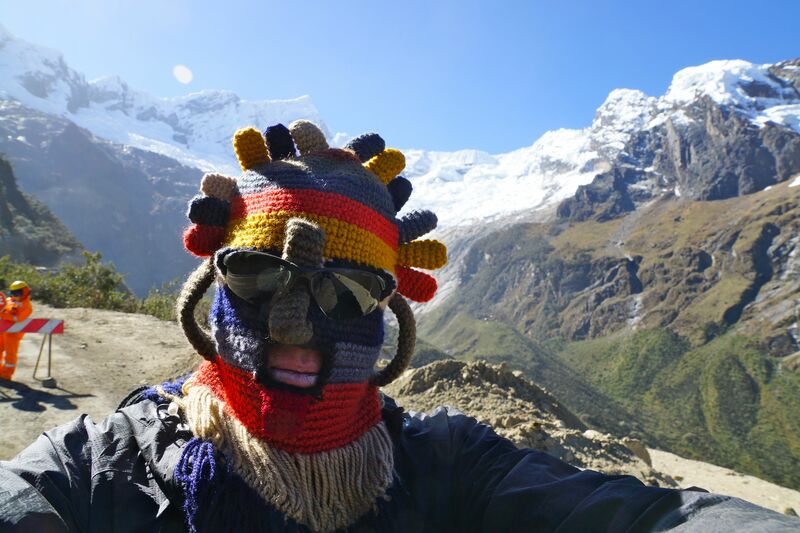 As I move southwards through Peru the hats are thankfully reducing in size; high conical Fedoras replacing the heavy white brims of the Big Hats, some even boasting colourful plastic flowers. Before putting a full stop on the time in Northern Peru, however, and particularly that spent in Big Hat country, (and by popular demand – at least one person requested it), here is a Big Hat song. Martin Luther King once famously said he dreamed of a time when a man would be judged, “not by the kilos of his brim but the content of his carrot cart”, and I like to think that he was thinking of the Big Hats when he said that. 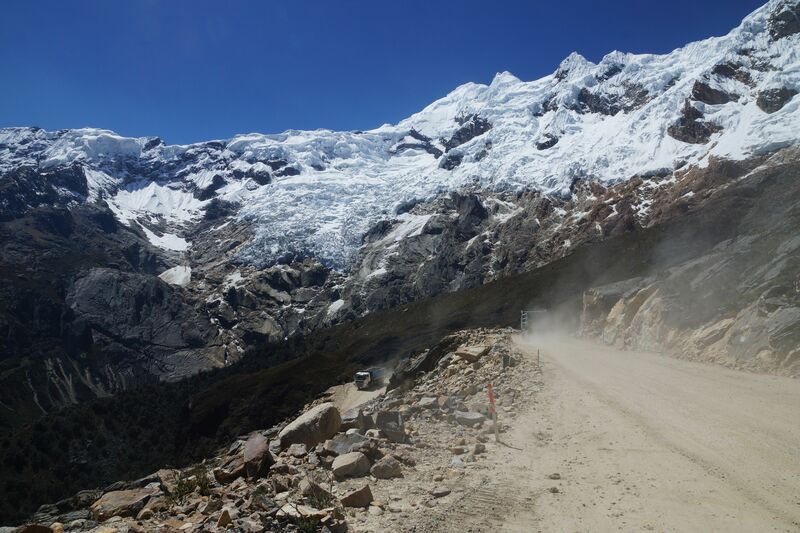 Well Peru has cranked up the volume on the scenery another few notches as the road cuts through the Huascaran National Park and the magnificent Cordillera Blanca mountain range. 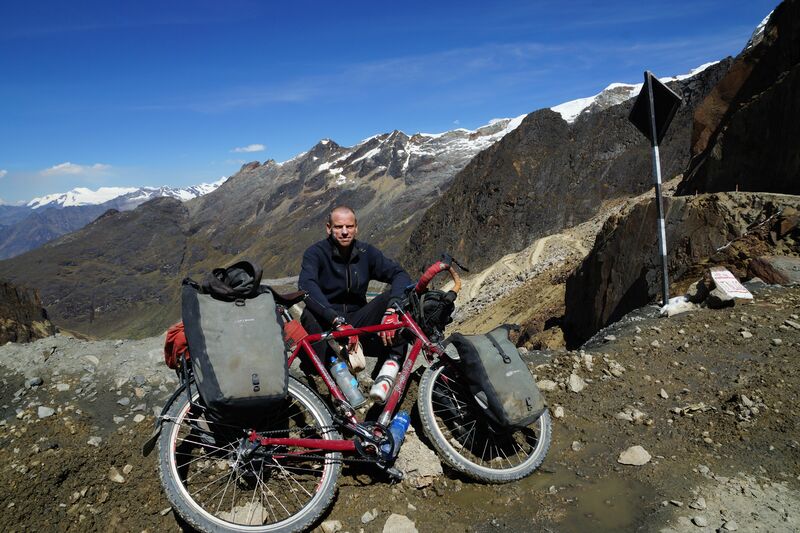 The ride across the range is one of the highlights of the Peru part of the trip and the Punta Olimpica Pass that crosses the range is a rare beauty with a long climb up to 4,950 metres and the twin glaciers near the summit. I set out up the pass with Jose and Corinne and then meet Eric again at the top of the pass (refer photo). On the eastern side of the Punta Olimpica Pass the road turns south and then there is some zig-zagging along some pretty back roads with virtually no traffic for a few hundred kilometres to the south-east towards the main road south. 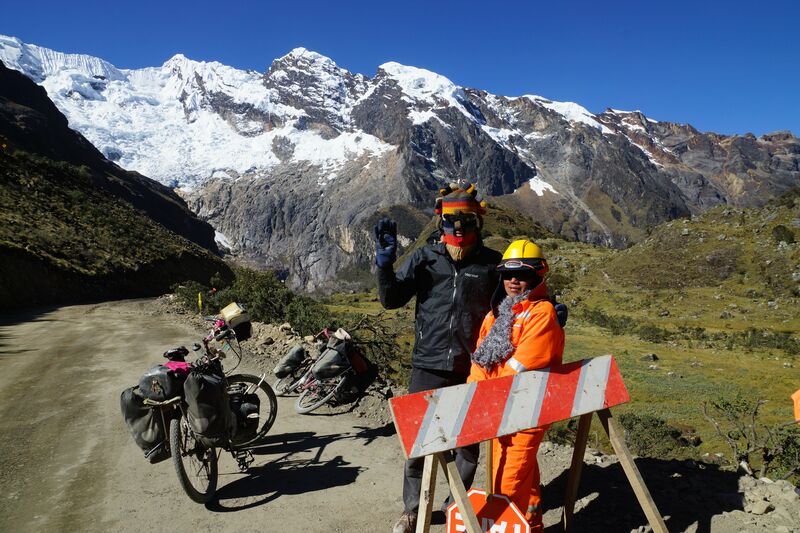 The ride is four and a half day’s ride over some nasty loose rock/dirt roads and another beautiful mountain pass (4,400 metres) and then a plunge down through 2,100 metres to and the city of Huanuco nestled in the valley below. I managed to get snowed on as I camped at the top of the second pass and had a pretty cold descent. 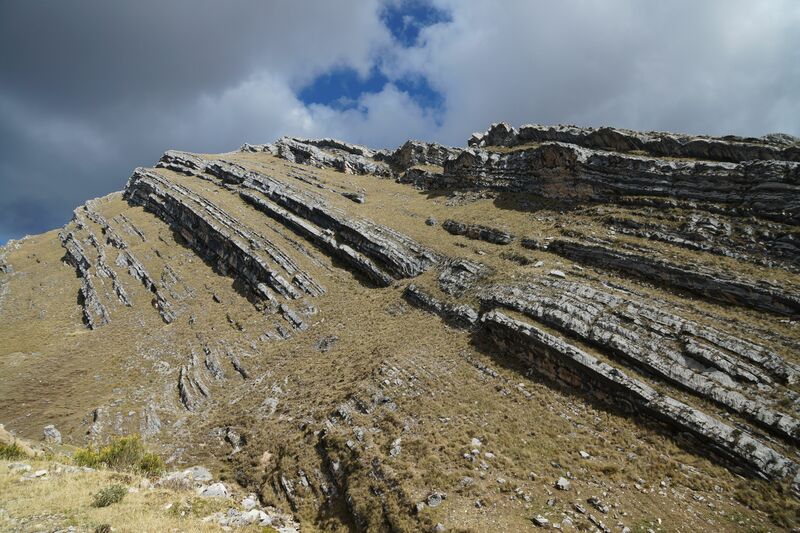 There is some footage of the Ponto pass at a time when I was a tad tired, and some of the abortive camping attempt at the top of the same pass on the attached video. Huanuco is a chance to rest a day or so, eat something that isn’t chicken and chips and also indulge a new-found timely interest in bike maintenance (I blame Eric). Eric and Buff3y at the top of Punta Olimpica Pass at 4,950 meters. Regular readers of this blog will understand how it pains me to ‘big-up’ any of the incredible feats of dering-do that I am somehow able to perform as part of this bicycle trip. 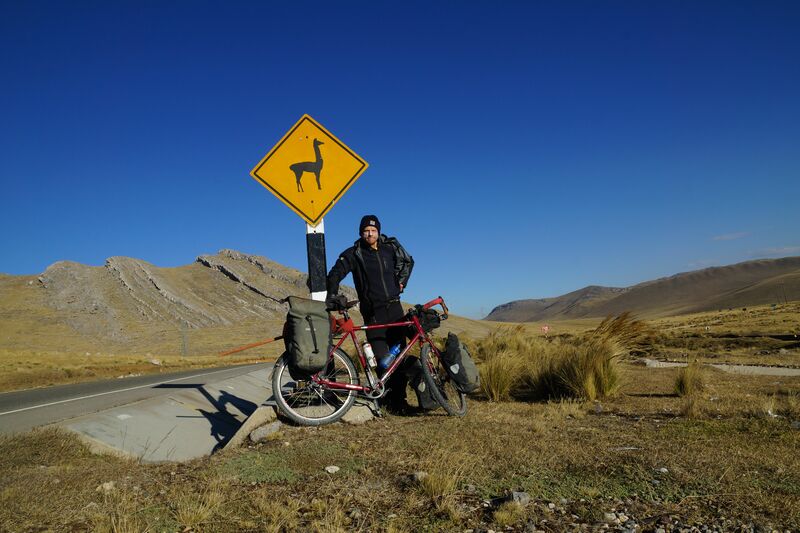 They will therefore appreciate that this posting is going to be complete and utter torture for me because the road running South-East from Cajamarca afforded your correspondent the opportunity to get well off the well-worn track and in doing so redefine what adventure cycling is all about. This is wonderful canyon country and here Peru delivers stunning landscapes with rivers carving down through high cliff walls, dirt tracks winding through harsh dry land with steep cuttings, tiny bridges and 100 year old tunnels on the road up towards the Cordillera Blanca mountain range and its picturesque snow peaks. The ride out of Cajamarca was one of the more frustrating of the trip to-date in that on receiving directions to ‘Cajabamba’ (or so I thought) I cycled off in the wrong direction towards the hill side village of ‘Cashapampa’, the victim of my own overly enthusiastic pronunciation of a ‘J’ and my informants’ misunderstanding of a couple of plosives. One and a half hours and 300m of futile climbing later I’m back where I started. I then decide to naively believe that the red lines on my map actually represent roads (silly error), so I head off on a (represented) secondary road just to discover some two hours later that the lines actually represent bugger-all and the road terminates in some mountain village. So back I turn yet again. Then, just to make the day’s riding a complete farce, I believe the directions of some prat and head off on one last fool’s errand to another dead end. At 4pm I’m back again at the 5km mark out of Cajamarca, exactly where I was at eight o’clock in the morning, feeling somewhat sorry for myself. I decide to retreat to the relative certainty of the main road south just so that I might go to bed with some distance covered. The upshot is that a total ridden distance in idiotic circles of 106km was covered for a mere 33km gain in road distance. Oh crumbs! It’s difficult to adequately convey just how gob-smackingly beautiful the ride into the river valleys south of the little town of Mollepata really was. Classic dirt road with tight switch-backs snake down for 10km to a turnoff from the main dirt road onto a track that then follows the Chuquiera River southwards towards what turned out to be a particularly challenging river-crossing obstacle just 15km further down stream. 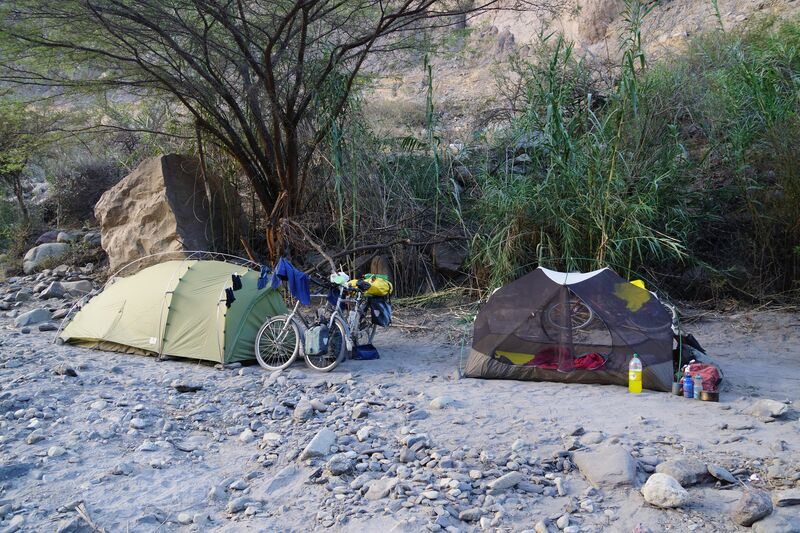 A French/Swiss couple (Eric and Lydie) are my cycling companions for this part of the trip having met in Mollepata and we camp just prior to the first river crossing. 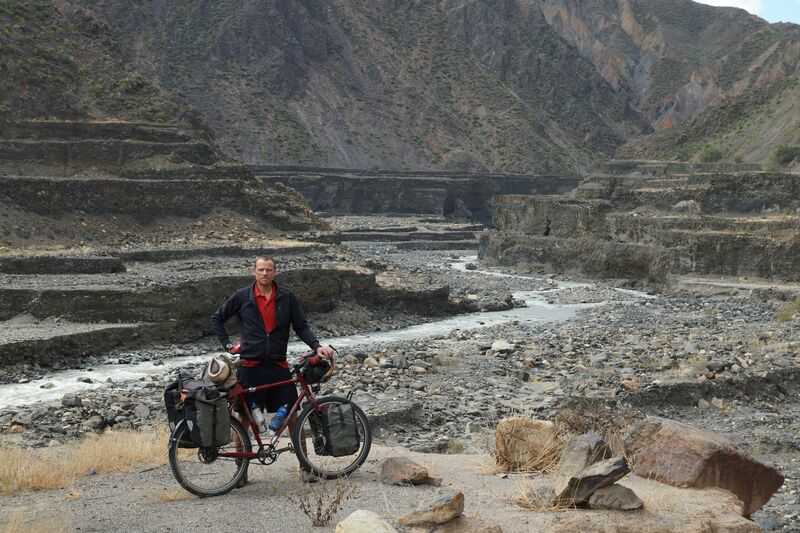 The following day was to prove one of the most challenging of the whole trip and in the morning we coax the bikes over the ash and shingle down to the river bank and assess the troublingly fast water flow. Undaunted, the bikes are unpacked and we begin the energy-draining task of transferring pannier bags, bikes and people across what was a pretty strong river flow. Just a few inches higher and the river would have been completely impassable meaning a depressing turn back up the canyon to the turn-off, something I am always loath, and am usually too bone-arsed stubborn to countenance. It is no exaggeration that there were a couple of moments in the midst of the river where the possibility of being swept away became more than a theoretical concept. Worse still, the Co-Motion might have been damaged! The first crossing complete without incident we proceed along the far bank for a short 4km before the next obstacle where the whole bank and the track along with it has recently been completely washed away after a landslide, leaving no clear way to get beyond. With no obvious river re-crossing point we are faced with a dilemma; turn back and take a large detour up and over some ugly switch backs, or get into the river and scramble along the edge for about 25 metres to get beyond the landslide area; not an enticing prospect. But there is no viable option if we are to continue. This is a big decision as the river flow is strong and there are a few places where we are up to our waists in churning water. Above our heads the remnants of the track hang precariously waiting to deposit more than a few tones of rock and dirt on our adventurous but foolhardy heads. Still, on we plough. (refer photos). Each pannier bag transfer took about 15 minutes to complete and hauling the bikes through the water was not an experience I’d like to repeat any time soon. However, a mere 2 hours later we are exhausted and actually still on the same side of the river from whence we came, but we have somehow got ourselves and all of the gear beyond the seeming impasse without drifting off down stream or losing more than one one fuel bottle which floated away from my bike in transit. Only one more re-crossing of the river to go and we should be clear to go on. 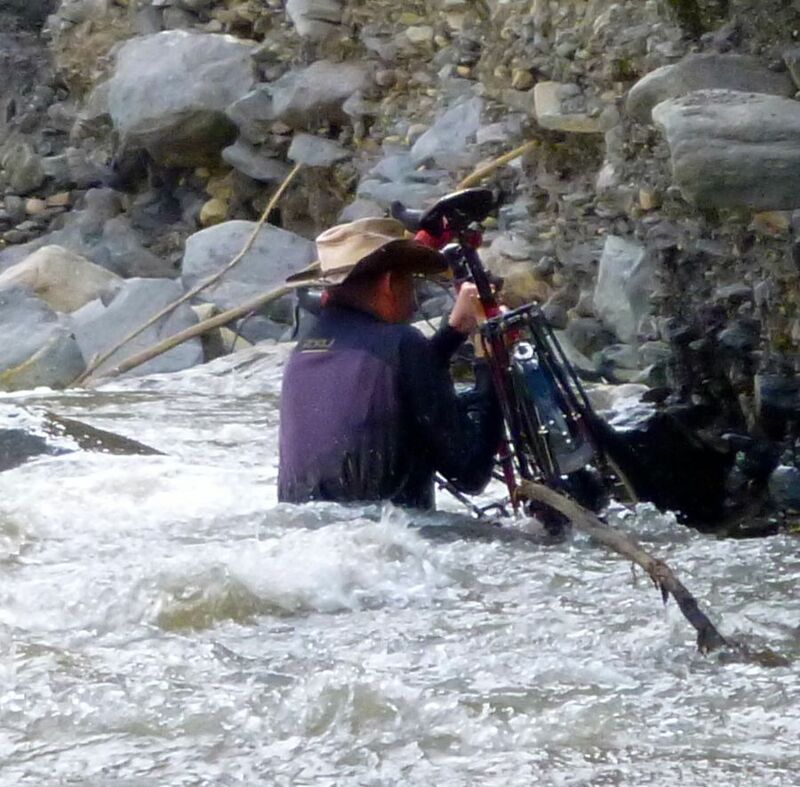 We find a decent place and get back across the river 1km down-stream with now well practiced relative ease and then scramble back up onto the track leading south along the canyon. The upshot is that we covered a total of 15km for the day, made two river crossings and one non-crossing), so we camp, exhausted but happy to have made it through. 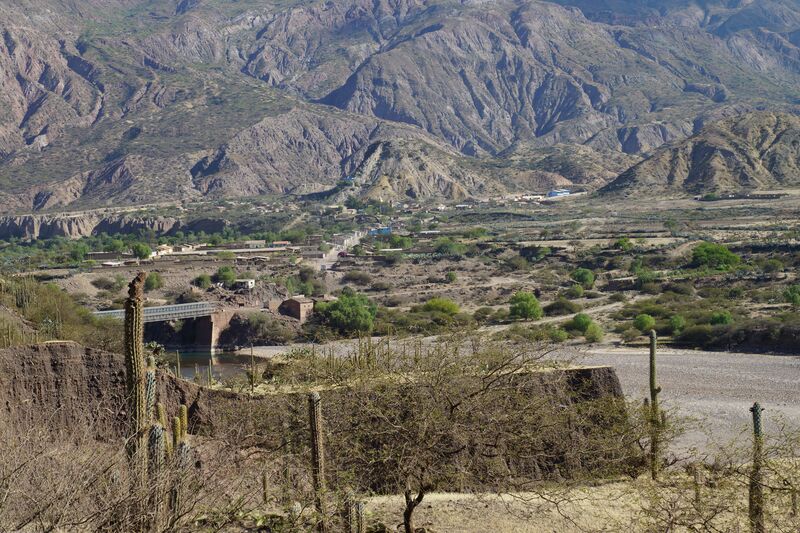 The reward is then being treated to some beautiful canyon riding; first down hill for 55km along side the Rio Chuquiera and then cut upwards into the Rio Santa gorge and then on to the more famous Canyon Del Pato before reaching Caraz. 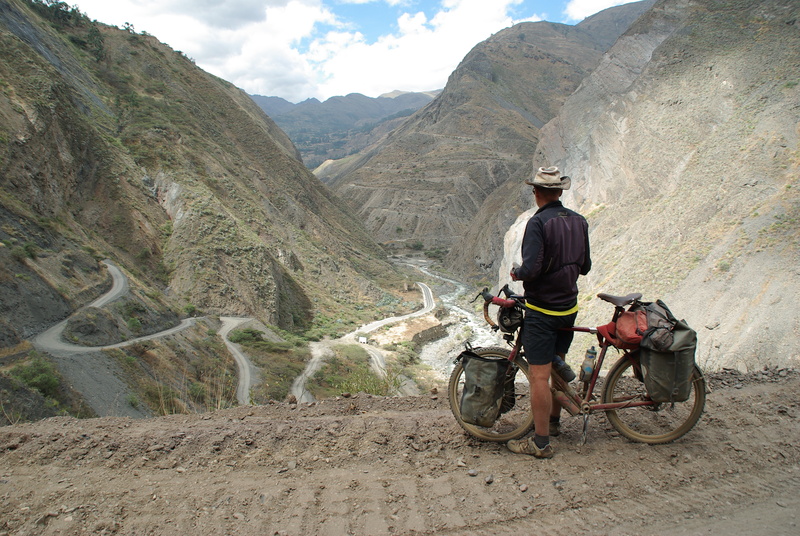 The old body was feeling a bit ragged after the ill-treatment I’ve dished out to it over the nine day ride from Cajamarca. 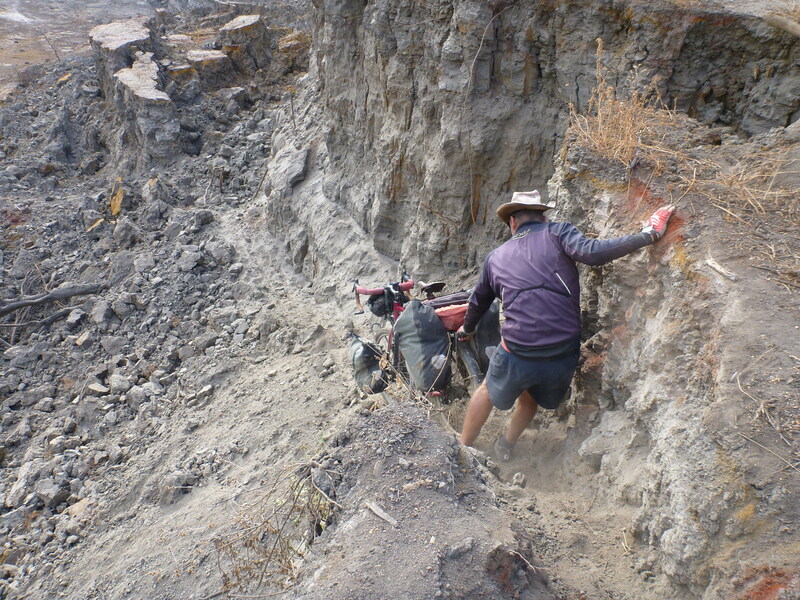 The mountain trekking /tourist base camp city of Caraz is therefore a very welcome location to rest, do some maintenance on the bike and unpack all of the gear (and of course reassess one’s life). Real coffee, tourist food and a relaxing sunny court yard of the hostel are just the tonic. Not using one’s much-abused legs for anything other than the bare minimum distance it takes to get between bed and coffee are the order for the next couple of days. STOP PRESS: ‘Fritz The Cat’, the catamaran that managed to transport me and the bike from Panama to Colombia just sank! (all crew and passengers rescued. Guide books usually kick off an introduction by saying something nice about the population of the country to be visited. In the case of Peru this appears to have been a bit of a challenge and the best that my edition of Lonely Planet could muster is to describe the people as “stoic”. They obviously heavily edited the first three drafts which no doubt used far less flattering terms, ‘a tad irritating’ figuring prominently. This would certainly have been a more accurate description for a good contingent of the inhabits the stretch of country surrounding Cajamarca in the north, or ‘Big Hat Country’. These hats have rims big enough to pick up satellite TV; not quite in the Mexican sombrero class but getting out there. Under the huge brims of the ludicrously over sized head-ware, the people are (as I found to my chagrin) capable of colossal feats of collective stupidity. In the face of the multiple Klepto-crats Peru insists on electing (Keiko Fujimori almost recently won re-election!) and the general lack of trust (justified evidently) in public institutions and more general social breakdown, people do tend to close ranks around family and clan and behave in less civil ways to others outside these groups. Regardless, I consider that the way the visitor is treated is a measure of a people and sadly the Big Hats are lacking in some of the more simple social graces. However, the choice of local tourist slogan: ‘We’re all a bit dim but the scenery is nice’ does appear to be a bit OTT even here. 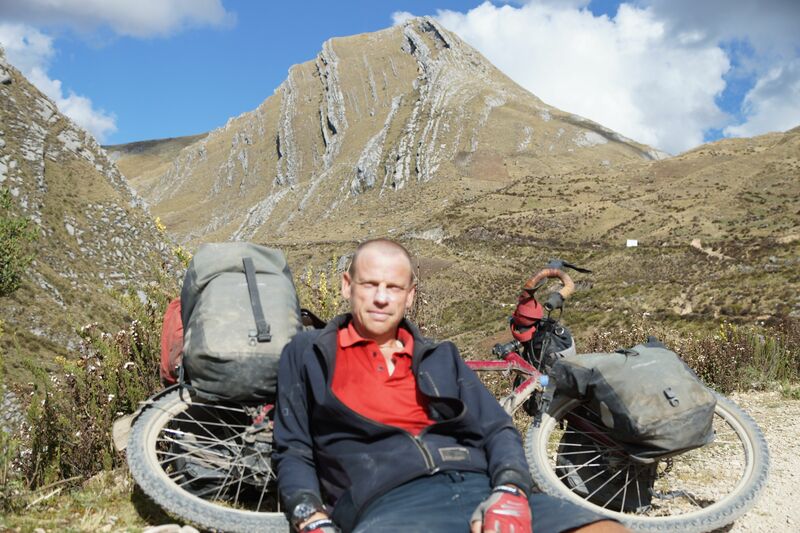 People with an inflated sense of the importance of political correctness will no doubt email and spout inanities along the lines of, ‘There is good and bad in all of us, People are the same wherever you go’, but they just need to ride a bicycle in Peru for a little while to discover just how very wrong they are. Perhaps the percentage of the population here allocated the responsibility of being dickheads (e.g. mini-van conductors/touts) merely take to their work with more enthusiasm than in other parts. Not sure. I would add (merely as a token and belated attempt to appear fair-minded) that riding south of big hat country the atmosphere is more relaxed and the people more welcoming. 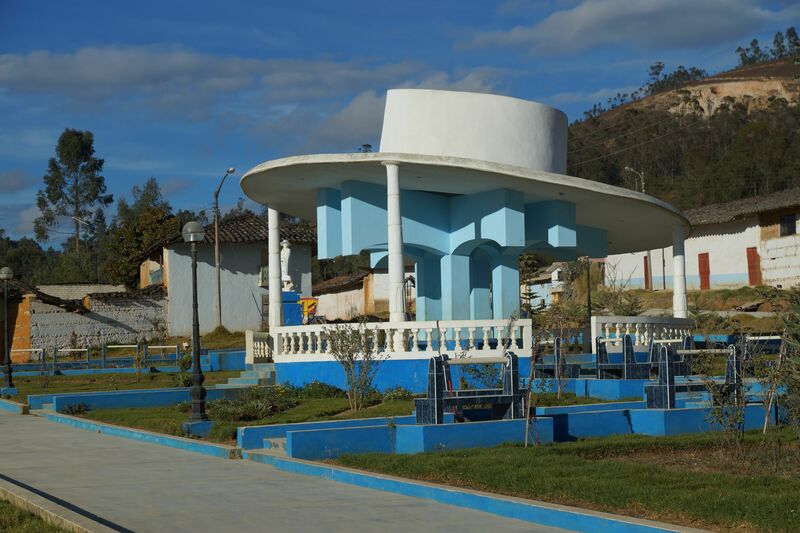 12km beyond The Valley of Instant Death is the lively little city of Celendin with its population of Big Hats sporting the required unfeasibly large head-wear (refer photo). There is a friendly atmosphere and the streets are replete with cartoon motif painted cyclo-taxis. There is, however, a bit of unrest in town and beneath the festive veneer of the local band playing in the central square there is an angry undercurrent of discontent over government plans to develop a US funded gold mine at Conga that supposedly threatens the local water supply. ‘ Conga No Va’ is the repeated call and the large rimmed Big Hat contingent is out in some force to protest. There are speeches etc and even a group of youths doing a display of street rampage but with little conviction and no damage. It was in this context that your hapless correspondent wonders out mid afternoon to see what’s going on. On seeing others using cameras, it was then that I made the error of taking a photo thinking that as I’m a long way away, that it would not be an issue. I couldn’t have been more wrong. Once identified as obviously being a representative of exploitative imperialist pig-dog-yankie gringo miners, a few Big-Hats start moving towards me in an increasingly menacing manner and this soon turns into a determined stampede of about fifty morons, their huge brims wobbling as they descend upon your correspondent. I do not exaggerate when I say that I was a might perturbed when, once surrounded, a couple of big-hated twits start grabbing for my camera. It’s all getting a bit ugly. A few tense moments ensue but my fluent Spanglish prevails and without much more violence than my shoving an overly zealous little Big-Hat away from my camera, I’m able to show them the ‘tourist’ photos (that were fortuitously still on the sim). They relax a bit and it is then that the situation suddenly takes a turn for the Pythonesque. I am then ushered to the stage and handed a microphone so that I might address the crowd in what can only be described as some pretty stressed Spanglish. Bugger me! What to say? “Conga No Va!” (more applause). Survived! I can understand people not wanting their pictures taken individually and perhaps I do represent everything ugly in terms of Americano Gringo imperialist first world exploitation of South America, but having a bunch of hyped-up Big Hats turn on the nearest tourist is pointlessly aggressive and more than a little bit silly.